U.S. Navy SEAL. Author. Speaker.​ Having been a featured guest on Fox News Channel, CNN News Room, Anderson Cooper 360 and more; former U.S. Navy SEAL Chad Williams draws from his experience in the SEAL Teams to communicate an instructive perspective on teamwork, resilience, leadership and self-motivation. ​Having been a featured guest on Fox News Channel, CNN News Room, Anderson Cooper 360 and more; former U.S. Navy SEAL Chad Williams draws from his experience in the SEAL Teams to communicate an instructive perspective on teamwork, resilience, leadership and self-motivation. Just days prior to entering SEAL training Chad's motivation and mental toughness would be tested as he turned on a television one morning to see unexpected graphic video footage of his mentor and training partner Navy SEAL Scott Helvenston brutally killed, mutilated and dragged through the streets of Fallujah, Iraq. Hung upside-down from the Euphrates River Bridge while an incensed Iraqi mob repeatedly celebrated and chanted in Arabic, “Fallujah is the graveyard of Americans.” Helvenston's body was set ablaze as Chad witnessed and learned an unwelcome firsthand lesson in what it was to be forged by adversity. Steeled in his resolve to follow in his Helvenston's footsteps and complete SEAL Training in honor and memory of his good friend, Chad entered the military's most difficult and grueling training known as BUD/S. As a member of Class 254 Chad and 172 other sailors vowed that they would die before ever giving up and quitting the military's most rigorous training. Those that would quit, were required to "ring out" which entailed ringing a large hanging brass bell three times and surrendering their class helmet on the Naval Special Warfare Center's asphalt grinder. Exercising mental-toughness, leadership and teamwork Chad climbed the mountain and completed SEAL Training alongside 12 of the original number of 173 sailors that vowed their dedication to completing the program. Serving his country proudly through multiple deployments as a U.S. Navy SEAL, on SEAL Teams One and Seven Chad continued to hone the qualities and values that our nation's best adhere to. In an ironic final operation in Iraq, Chad's SEAL Team was set up on a premeditated ambush similar to the location and scenario that took the life of his mentor Scott Helvenston but on that occasion Chad and his Team were able to overcome them enemy and complete the mission. ​Utilizing U.S. Navy SEAL ethos, Chad lends his first hand knowledge and experience as one of America’s most elite to relate the vision and character of an effective Navy SEAL leader. • Aim small, miss small. As a Navy SEAL looks through his scope down range, he first identifies and acquires his target in the crosshairs of his scope before he makes the irreversible commitment to pulling the trigger. Aiming small ensures that should he miss, it will be to such a small degree that he will still be on target. Similarly the effective leader in the civilian world cast their vision, identifying the target as they look down range into the future, aiming small (particular) ensuring that missing small will still hit the targeted vision. • Common man with an uncommon desire to succeed. It is not enough for a common man to have the vision of becoming a Navy SEAL; it requires that the common man obtains an uncommon desire to succeed. Success is not a matter of DNA. It is not in the bones or muscles of man, but the mind. The effective civilian leader will succeed when his vision comes to fruition, not by uncommon natural born ability but by being a common man that embraces an uncommon desire to succeed. This principle is easily depicted in the lives of those that didn’t make it through my SEAL training and those that did. • Beware of the pitfalls of pride. A trademark of those who serve in the SEAL Teams is humility. All too often with great position can come great pride. There is no place for prideful arrogance in the SEAL teams or the civilian leader. Prideful arrogance is a sure fire way to lose the loyalty of those who will respect your position but not you. Those lead by the prideful leader will not give their best efforts but just enough to keep their job or get the task at hand completed. Humble leaders a.k.a “Servant Leaders” put the needs of others ahead of themselves, they pour into and develop those around them, investing into their people, investing into their loyalty. When you have their loyalty they will give you their all. They will run into a hail of bullets if you asked them to. That is literally the type of loyalty my platoon had for our servant leader “Chief.” When the fellas were called to advance forward into an ambush that we were on the wrong end of, there was no hesitation as that command came from Chief. • We demand discipline. Those who demand discipline must demonstrate that discipline themselves. It comes down to habits. Often times when one thinks about habits they think of bad habits but good habits can be developed in a similar fashion. The civilian leader must display discipline before he can honestly expect those around him to be disciplined themselves. I had the personal privilege of being led by such a SEAL leader: Scott Helvenston. He demonstrated discipline as: the youngest man to make it through SEAL training at 17 years old, world champion pentathlete, fastest SEAL on the training obstacle course and much more. Scott’s example inspired me to obtain the discipline he demanded of me; ultimately leading to my successful completion of the military’s most grueling SEAL training. • Shoot, move and communicate. Putting it all together is what SEALs do best. The right vision, uncommon desire to succeed, humble and loyal warriors that demand and demonstrate discipline…those principles are the very foundation to good communication. Such a leader can communicate and expect those around him to listen and run with it- not because they have to but because the want to. It was our ability. That’s loyalty! • Ability to control emotions and actions regardless of the circumstances. The absolute worst circumstances a soldier can get thrown into is a premeditated ambush. That is exactly where my platoon found itself on our last operation in Iraq. It started with Chief and trickled down to each combatant, a calm and cool collectedness that enabled each man to do what he does best –in our case, use deadly force– keeping us safe in the moment and getting us back to safety at the end of the night. One of the final lines in our SEAL creed reads like this, “In the worst of conditions, the legacy of my teammates steadies my resolve and silently guides my every deed.” Never forget that freedom isn’t free but paid for in the blood of warriors on the battlefield like U.S. Navy SEAL Mike Monsoor who smothered a grenade, absorbing the blast upon himself to save the lives of his teammates. “Greater love has no one than this, than to lay down one’s life for his friends.” My mentor Scott Helvenston sacrificed his life for the love of his country and desire to help the helpless. That is the legacy of teammates like Scott, Mikey and may the legacy warriors like them steady your resolve and silently guide your every deed to accomplish goals that are only made possible by the blood sacrifice of those that are willing to lay it all down for us! 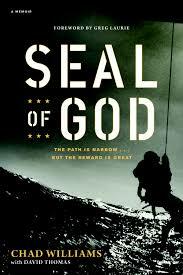 ​Chad Williams, former US Navy Seal and author of SEAL of God, shares his personal experiences of SEAL bravery. Chad communicates the power of sacrifice and leadership through the story of his experiences.